The German cruise ship AIDA Vita (@aida_de) made its first call on Tampa Bay Wednesday, pulling into port at 8 a.m. after an overnight trip from Miami. The visit by the 1,200-passenger cruise ship was the first of six scheduled for Port Tampa Bay between now and April. Passengers spent the day discovering all the exciting things Tampa Bay has to offer. They visited Busch Gardens and The Florida Aquarium along with Clearwater Beach and the Dali Museum. Local dignitaries met the ship and exchanged gifts with the captain. By 6 p.m., AIDA Vita&apos;s passengers were boarding the ship for their overnight trip to New Orleans. The 11-day cruise covers the Gulf of Mexico and includes Cozumel, Mexico, and Key West before returning to Miami. Tampa Bay is the departure point for four cruise lines, but AIDA is the only line stopping here in transit. The AIDA Vita returns again on Jan. 7. Other days in port include: Jan. 28, Feb. 18, March 11 and April 1. 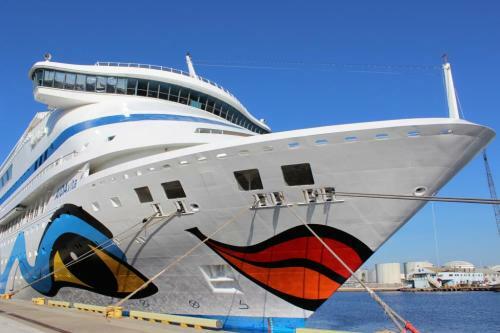 AIDA Vita will return to Tampa in in late 2015 and early 2106 and again in late 2016 and early 2017. Visit Tampa Bay is recruiting fluent German speakers to meet the AIDA passengers and help them plan their day in port. If you would like to help out, you can contact Susan Williams, swilliams@visittampabay.com, to sign up for a future visit from the AIDA Vita.